My son has always enjoyed bath time, and so have I because it’s a great opportunity for him to play with things that aren’t electronic or technology-based. He loves coloring right now, so bath crayons are a huge win! Yes, you’re going to have to have a lot of patience for this one…or the ability to tune out shrill noises. 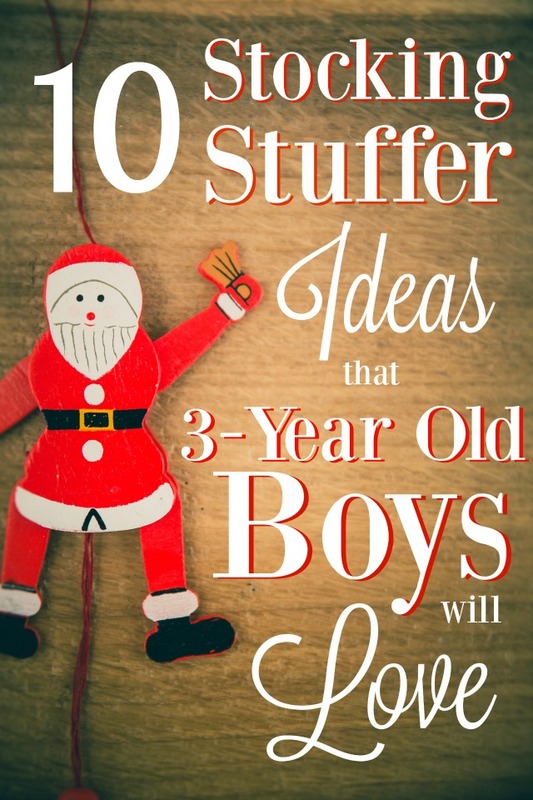 But if you can do that, you will have yet another non-technology toy that your son will LOVE. In fact, this is not only one of my son’s favorite toys, but it tends to be a favorite of his dad, grandfathers, and uncles. This is an easy win that will really get your son’s imagination going! Stickers always work. And here’s my recommendation: Get a set (like this one) that can be divided in half and save some for your son’s Easter basket. Or if you do something cute for Valentine’s Day, save it for then (or for all 3!). This makes them feel even less expensive and stretches out their use over time. Regardless, they’re one of the cheaper stocking stuffer options and shouldn’t be hard to find for under $1-$2 (like these Mickey Mouse ones). My son is obsessed with trains right now – ALL trains. Thomas is certainly the favorite, but Chuggington and any ole train are a close second. Almost all trains go with Brio tracks and they’re the perfect size for stocking stuffers, so they’re a great addition. To cut back on the price, you can opt for generic trains that are way cheaper. Do the same thing as with the stickers and save half for the Easter basket or as a Valentine’s Day gift and you’ve made them even less expensive! There are also some Brio add-ons that could slide right into a stocking and aren’t that expensive (this train stop bell is under $10 → Brio Magnetic Bell Signal). 3-year old boys are just at the age where exploring becomes really exciting and exploring in the dark is no exception! My son was so excited when he got his first flashlight (it certainly helped that it was Thomas-themed). There are lots of toddler-style flashlights available, so whatever your 3-year old loves, go for that! I already told you I’m a huge fan of making bath time a fun activity, so this is yet another great way to make it more exciting! Not only does each tab make the water a different color, but you can mix tabs to create new colors and teach your 3-year old something new! These tubs will also last a really long time (another bonus!). I know this seems boring, but 3-year olds love dressing themselves (or attempting to at least), so fun socks actually become exciting for them! And since you have to buy them anyways, you might as well give them a grand introduction. 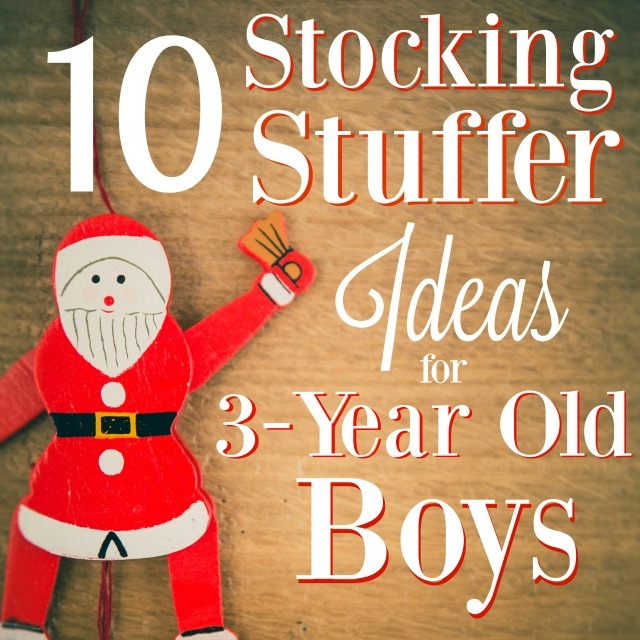 And of course they’re the perfect size for filling up a stocking! Not only are matchbox cars a lot of fun for little boys, but you should be able to come across some really inexpensive one if you keep your eye out. My grocery store sells them for $1 a piece and I’m sure they show up in a lot of other dollar displays! You can never have too many crayons, especially if they get pulled out during play dates. And if you’re sick of seeing the same old sets, try out some new variations – they make large crayons, glitter crayons, metallic crayons, and neon crayons. 8-packs are the perfect size for stocking stuffers! And of course these variations are especially great if you’re planning on putting some coloring books under the tree! My son fell in love with chalk this summer…and so did I. Sure, he shows up at the door covered in chalky residue, BUT that’s the only clean up. The rest is taken care of by the rain! And it’s a great way to get them outside. It’s the perfect size for stocking stuffers and you can definitely come across some inexpensive options. Good luck with your Christmas shopping this year! Let me know if you’ve got any other big winners in your 3-year old’s stocking!